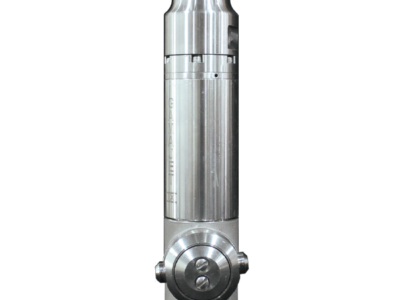 Gamajet’s entire line of tank cleaning products result from specific customer needs and the Alfa Laval Gamajet A8 falls right in line with that tradition. The Gamajet 8 machine is so easy to handle, versatile and effective that sanitary customers were demanding a hygienic counterpart. Therefore, Gamajet responded with the Gamajet A8. This versatile, fluid-driven machine features Gamajet’s revolutionary new gearbox that not only ensures the machine runs almost twice as long, but is also designed for quick and easy change-out in the field. 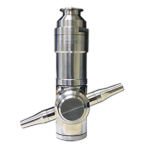 Lightweight, powerful, and features self-draining, self-flushing, and self-lubricating capabilities, the Gamajet A8 is designed completely with FDA compliant materials. 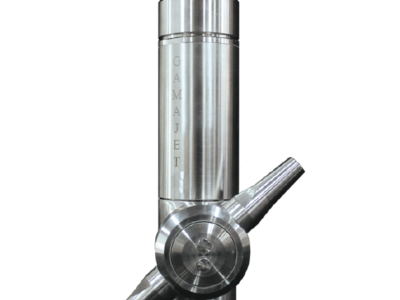 The Gamajet A8 is the answer to efficient, effective and hygienic CIP. 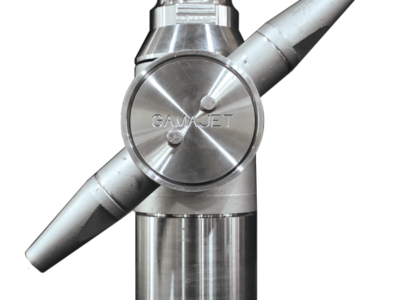 Characteristic of all Gamajet machines, the Gamajet A8 utilizes patented rotary impingement cleaning technology; ensuring tanks are cleaned quickly and effectively and drastically reducing the amount of water, chemicals, and energy used during CIP. 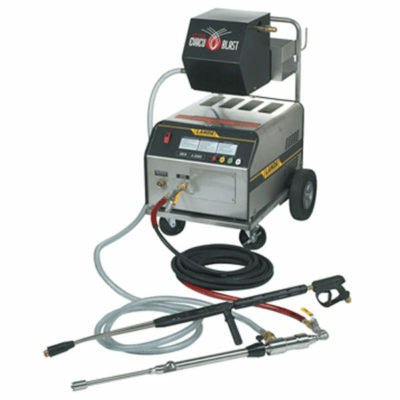 It is also designed to eliminate the need for dangerous and costly manual cleaning. 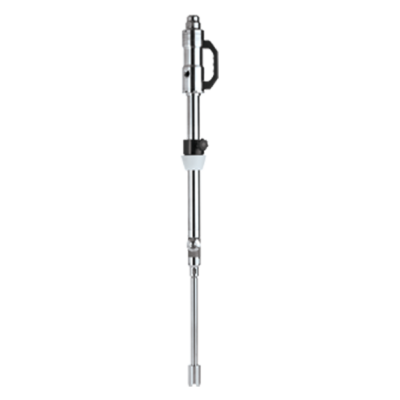 Impeller & Final Shafts: For increased wear resistance, the input and output shafts are plasma-sprayed with a Chromium Oxide coating on Stainless Steel. 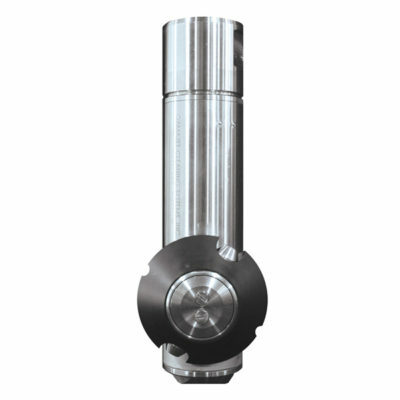 Shaft & Gearbox Bushings: Input shaft thrust is absorbed by a Tungsten carbide bushing. Gearbox bushings are food grade PPS or other non-cupric material. Static Seals: O-Ring materials are selected for each application. Food Grade EPDM is standard, Viton® with Kalrez®, Zalak® available. 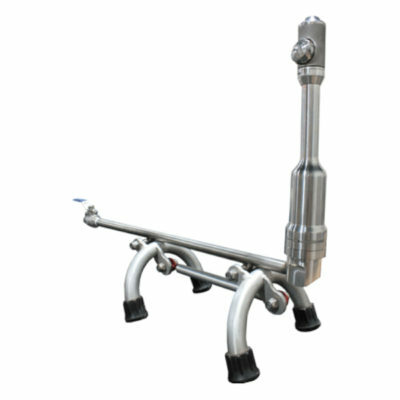 Other materials can be supplied on special order. Nozzles: Standard nozzle sizes 1/4″ (6.35 mm), 9/32″ (7.14 mm), 5/16″ (7.94 mm), 3/8″ (9.53 mm) and 7/16″ (11.11 mm). Other nozzle sizes available upon request. Drive Mechanism: The wash fluid enters the Gamajet at the inlet collar where it encounters and spins turbine blades. 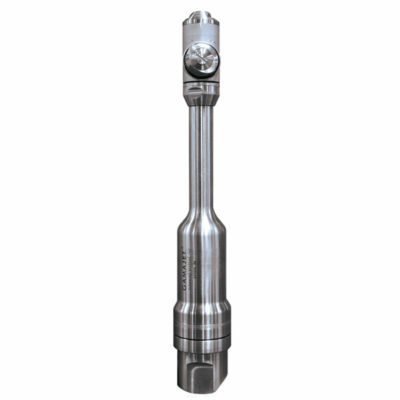 The turbine blades are attached to the top of the input shaft, the bottom of this shaft is connected to the inside of a flow-thru planetary gearhead which then turns the body in the horizontal plane and the nozzles in the vertical plane. 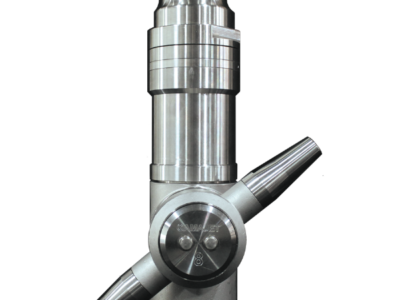 Planetary Gearhead: The flow-thru planetary gearhead has an external casing made of stainless steel. All gears are stainless steel. The gear bushings are a food grade PPS. The wash fluid is circulated through the gearbox to lubricate, clean, and take away heat from the internal gears.